Deputies with the Hillsborough County Sheriff’s Office say the majority of drivers and pedestrians they come into contact with have no idea how to use an unmarked or “implied” crosswalk and the consequences can be deadly. 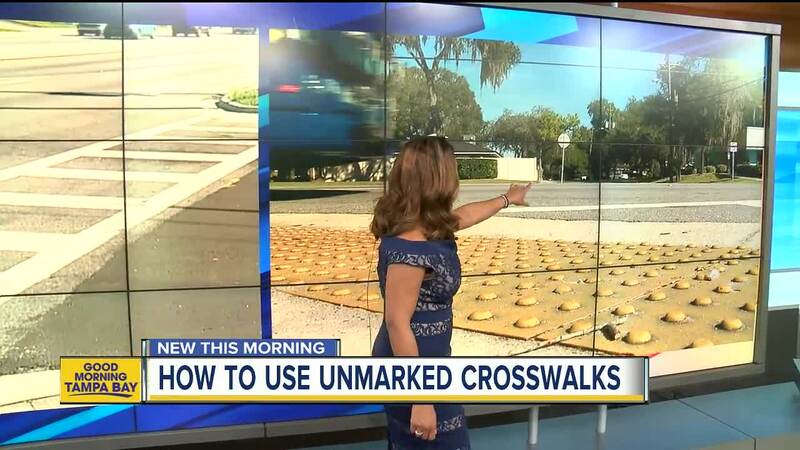 HILLSBOROUGH COUNTY, Fla. — Deputies with the Hillsborough County Sheriff’s Office say the majority of drivers and pedestrians they come into contact with have no idea how to use an unmarked or “implied” crosswalk and the consequences can be deadly. There are thousands of unmarked or implied crosswalks across the Tampa Bay area. Deputies said you can recognize them when there is an intersection with no official crosswalk markings but has a sidewalk that ends and continues across the street. Under Florida Law, the driver of a car has to stop and yield when a pedestrian is in the crosswalk and is in the same half of the roadway of the area. Drivers also have to stop and yield if a pedestrian is approaching them at an unmarked crosswalk in the opposite half of the roadway, according to Florida Statute 316.130. However, pedestrians can’t just dash out into the road and must cross at an unmarked crosswalk at a 90-degree angle. Drivers who fail to stop for a pedestrian at an implied crosswalk can face at least a $163 fine. Pedestrians who dash into the road can also face fines.